Stage fright is a state of anxiety associated to various symptoms which may lead us to lose self-confidence. The most affected professionals are artists and people related to media. There is not just one main cause which results in the phenomenon. Some people feel fatigue, tremble, sweat, feel the urgent need of going to the toilet, are dizzy, have palpitations and suffer from dysphonia. Others have a feeling of guilt or shame, are irritable, are afraid of not succeeding or getting it wrong and have panic to the public's opinion. These are all different ways of feeling stage fright. Therefore, the therapy aimed at resolving stage fright must be adapted to the type of anxiety the artist feels: physical, cognitive, emotional or behavioural. There may be more than one cause at the same time. Ana Velázquez, manager of the Centre for Prevention of Injuries in Performing Arts of Barcelona tells us: "In CPAE we are specialised in treating and preventing stage fright symptoms. We do it daily and discreetly with people related to the media and the art world who want to optimise their performance. The objective is not to completely eliminate stage fright because, to a certain extent, it helps us bring out the best in us in the moment of the performance. A succesful treatment needs of a multidisciplinar staff in which the following factors are combined: postural and scenic work (giving tools through interpreting), physiotherapy and manual respiratory therapy (life is movement and fear paralyses our muscles and breathing, we need to release the tissue restrictions), a healthy diet, proper physical exercise, emotional therapy (going through our beliefs) and, finally, a correct relaxation technique that goes with the way we are". 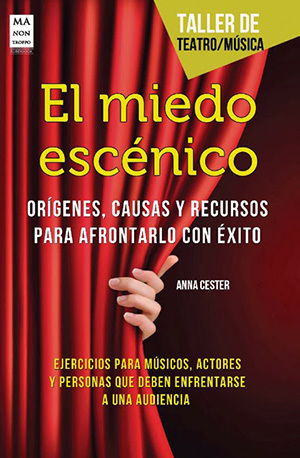 Anna Cester, musician, doctor and author of the book El miedo escénico remarks that "It is not the situations which cause the stage fright but the way we think of and assess them. The decision of not going on stage anymore is determined by the feeling resulting from the situation; for example: the feeling of guilt or lack of happiness or the feeling of failure. It is not a decision controlled by the fear emotion or the panic in itself". This fear may affect any part of our body, preventing us to do our job: go on stage. It may appear any moment and for very different reasons, even in very successful careers which are completely consolidated. It may be linked to education, a non-desired experience, beliefs or irrational fears associated to the moment of going on stage or performing. The limbic system is the one who makes us go through this bad patch. Stage fright can be prevented and treated. The success of the treatment consists of making stage fright become our ally and using it to our advantage. Do you want to know if you suffer from stage fright? Take this test!